Congratulations to Casey Lellock on receiving the 2016 Work Ethic Scholarship Award from the mikeroweWORKS Foundation! Casey received a $3,800.00 scholarship! He completed all of the necessary application requirements, including signing the S.W.E.A.T. pledge, which stands for "Skill & Work Ethic Aren't Taboo". 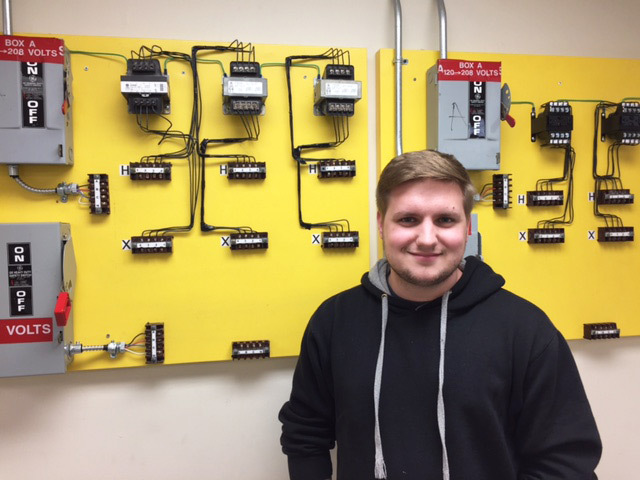 Casey is currently in his second semester of the Maintenance Electricity and Construction Technology program at the DuBois school. Keep reading to learn about Casey’s journey in his own words. I chose to pursue Maintenance Electricity and Construction Technology at Triangle Tech's DuBois campus in June 2016. I enrolled at Triangle Tech for a different reason than many of the other students. I actually hold a Bachelor's of Science Degree in Energy Engineering. When I graduated in May 2015, I was unable to get a job in my field even after sending hundreds of job applications. I decided I needed to do something different. Since I was interested in electricity and having learned the generation side of the field in college, I decided that the wiring and installation side of the industry would be a good path. Maintenance Electricity seemed to be an industry that still had jobs available. By attending Triangle Tech, I would be able to learn things the right way, the first time, instead of relying on the workforce to show me how things are done. I first learned of the Mike Rowe scholarships when I started at Triangle Tech. Though I wasn't sure if I had a chance, I decided to apply anyway. I wrote my letter to the foundation outlining my entire life, which I had been trying to uphold the same standards that they had based their organization, hard work, integrity, responsibility, pride, and general good workmanship. I explained that these were all traits I had learned from my grandfathers and father through the years and that I would be appreciative of any scholarship that I could get. After a few months, I was notified that I had received one of the Work Ethic scholarships, and I was overjoyed. I feel so honored to have been chosen. I promise to work as hard as I can to uphold the standards that I agreed to. No matter how many rejections you get or how much paperwork you have to fill out for scholarships, just never give up. Eventually your hard work will pay off in one way or another, just like what happened to me with this scholarship. As part of Mike Rowe’s “PR Campaign for Hard Work and Skilled Labor,”mikeroweWORKS.com was launched in 2008 as a trade resource center for people seeking employment opportunities in the skilled trades. Later that same year, the mikeroweWORKS Foundation was established to further support those efforts and help promote vo-tech education by awarding tool and educational scholarships and providing other financial assistance to those pursuing a trade. For more information, go to mikeroweWORKS.com.